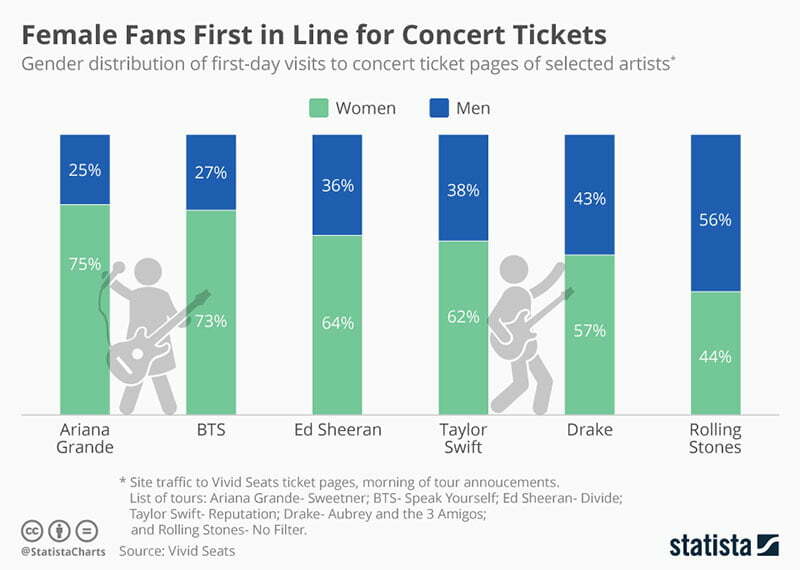 Data presented by online statistics portal, Statista, has shown that women generated the majority of traffic to ticketing sites on the first day of ticket sales for a variety of high-profile world tours. Female fans drove around 73% of traffic to Vivid Seats on the morning that tickets went on sale for K-pop group BTS’ first world stadium tour, Love Yourself: Speak Yourself. The band sold out five major stadiums across the United States and Europe, including the Rose Bowl in Los Angeles (90,888-cap. ), London’s Wembley Stadium (90,000-cap.) and the Stade de France in Paris (80,000-cap.). Women generated an even higher percentage of traffic for Ariana Grande’s Sweetener world tour (75%), which sees the star perform across Europe and North America. Female fans also drove more traffic to ticketing pages for Ed Sheeran’s ÷ world tour (64%), Taylor Swift’s Reputation tour and Drake’s Aubrey and the 3 Migos tour. Only for the Rolling Stones No Filter tour did men have a bigger presence on the ticketing site than women, driving 56% of the traffic. The data corresponds with information collected by event discovery guide and ticketing outlet, Skiddle, that shows women now buy 13% more live event tickets than men.